Photo of the day: INHALING – Beth’s gloves are socks with the toes cut off. Her shawl is the cut off bottom of a dress. The 1970’s denim jacket was found in the trash and made a great vest once the sleeves were cut off. “New York has cool crap you can find, but you gotta look at night,” Beth explained as she took a break from putting her New York wardrobe together. This entry was posted on May 4, 2013 by newyorkcityinthewitofaneye. 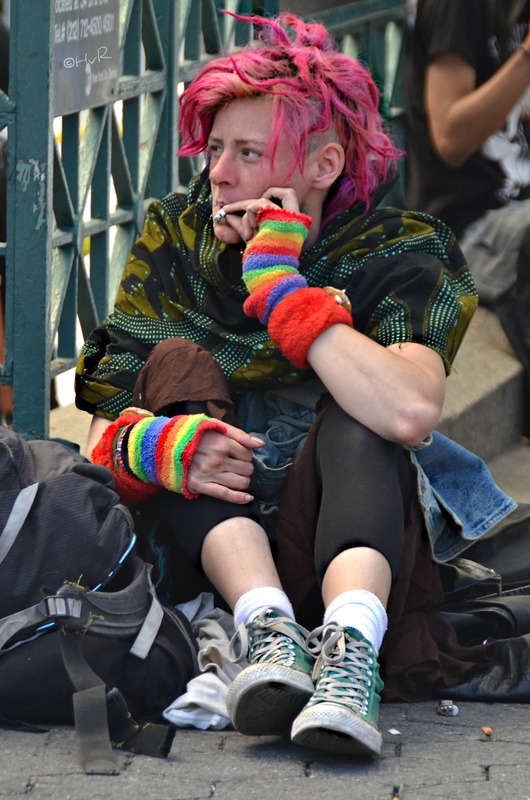 It was filed under DAILY PHOTOS WITH STORIES OF NEW YORK CITY and was tagged with 420, fashion, Hans Von Rittern, homeless person, homeless woman, inhaling, Manhattan, New York City, New York photo, Photo of the day, pink hair, punk fashion, recycling old clothes, smoking pot, smoking weed, street fashion, Union Square Park. Maybe I should smoke some weed and get creative with my wardrobe. Far out man :o) !